After providing the glimpses of the next Windows, one of the screenshot leakers has now obtained a short video showing off a build of the very new Windows 9, aka "Threshold," features as well as how users can expect to use it. Two German sites, ComputerBase and WinFuture, posted 20 screenshots on Thursday of what purports to be next major version of Windows, presumably called Windows Threshold that Microsoft recently distributed to its partners, giving us a closer look at Microsoft's next platform. Now, there's a video on YouTube, provided by German publication WinFuture, which shows how the returning feature might work in the next iteration of the Operating System. As calculated from the screenshots, the video doesn't provide any major new information about Windows 9, but pretty much confirms what we expected. As promised by technology giant Microsoft, the upcoming Windows operating system will finally bring back the Start menu, one of the most iconic elements of Windows, which the company inexplicably vanished in the previous version. 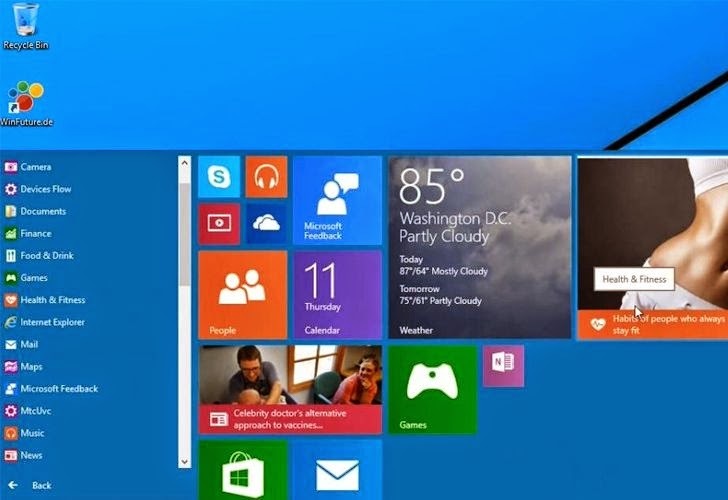 The video clearly shows how the Start menu supposed to work. Windows users will be able to either enable it, or use the Metro UI as it’s currently available. Start menu comes without any Live Tiles. It’s essentially a smaller version of the Windows 7 Start menu. Once the user enabled the Start menu, they will be served a new kind of Metro-infused interface compared to general Windows Start menu. It lets users to customize it according to their wish, in a similar manner like in Metro UI on desktop or mobile. The video also shows that the taskbar for the new operating system includes an icon for creating and closing virtual desktops. This means the Workspace and their open programs can be accessed from this icon. The interface remembers us of what's already been available on OS X and even Linux for years. In addition, Windows 9 also provides a mechanism that will allow testers to weigh in on features and functionality that Microsoft will be providing via regular updates to Threshold. First leaked screenshots and then video give us an idea that Microsoft will formally unveil its new operating system in October, although Microsoft hasn't confirmed any information about its future Windows updates.